So obviously I could add those numbers up in my head, but one year of stats isn’t nearly complete for my blog. Maybe Disqus offers more stats for paying customers (and to be clear, I’d totally understand that), but I can’t find any links/details about that if it exists. So screw it - let’s use the API and build our own tools! I’ve set up a new repo where I’m going to start building my own stats. The API is rather simple and you get a somewhat generous usage allowance (1000 hits per hour) out of the box. Also, you don’t have to use OAuth for the types of operations I need, and that makes it even easier to use. 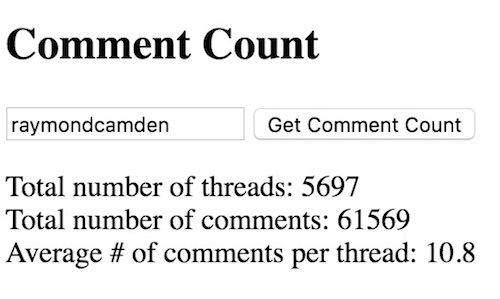 For my first demo, I focused on what started this off - just figuring out how many damn comments my site has gotten. Not surprisingly, there is no direct API for this. 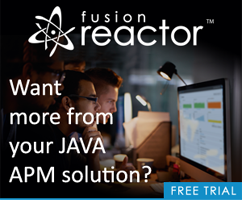 There is an API to get details for a forum, but that information isn’t provided. The best I could come up with was the API to get lists of threads. They do a great job of supporting pagination in all their APIs, so my code simply needs to paginate over all the threads and then do math. Let’s take a look. First, the front end view, which is rather simple. doProcess is a recursive function that gathers all the threads. 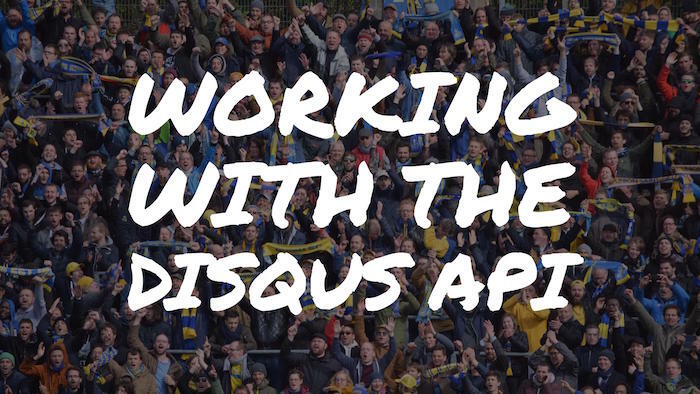 It uses the Disqus pagination support to go over all the threads and create a large array of threads. The thread data contains a post count which doCount uses to create the report. You can run the demo here - but note that I’m using my public API key. Most likely it will not work for you. If you want to use my tools, download the source, create your own key (at Disqus of course), and go to town. Ok, now for some notes! You may be curious about ‘threads’ - threads are simply unique locations for your Disqus embeds. So for a blog, it would be every site visited. That’s an important thing to note. If you visit a new bog entry, Disqus will create a ‘thread’ for it even if no comments exist yet. I like that I can see an average number of comments. What I really want to know though is how those comments appear over time. I’m curious both about my traffic per month/year, as well as my traffic in terms of the age of my content. What I mean by that is - let’s say my comment traffic is pretty much consistent. What may not be consistent is that people are commenting on older blog posts versus new. Technically Disqus can’t help with that. A thread is created when someone visits the blog post. So I may have a very old blog post that no one visited. When someone visits it today, the thread is new, but the content is old. 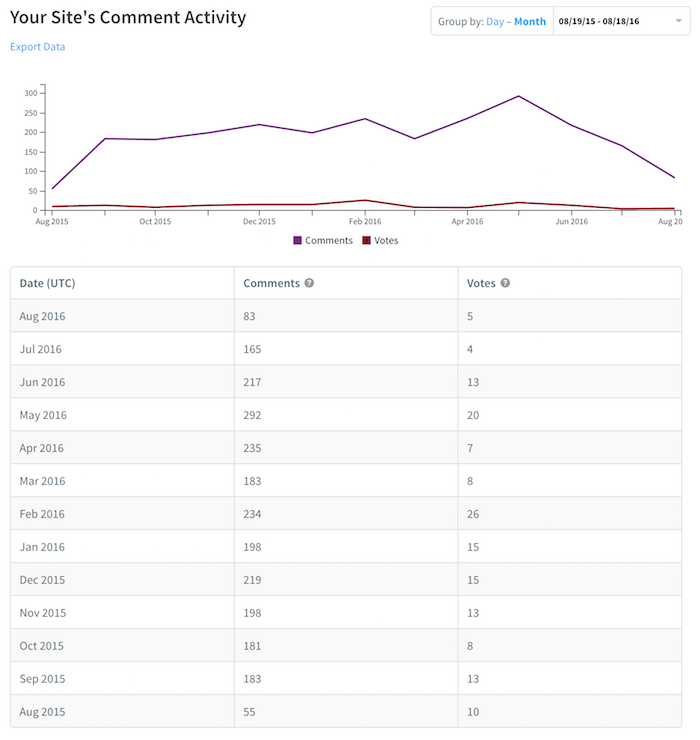 Since my content has date information in the URL, I can use that to perform analytics based on my content. This all comes down to one question - is my content more engaging now than it was ten years ago?